Number one painting medium. OIL PAINTS of course. You can call me biased if you want but nothing else comes close to oil paints for expressing your creativity. I have tried many other paints, and they all have their merits, inks are beautifully transparent, acrylic dries super damn quick of course, but nothing beats oil paints for the depth of sheer beauty and the bountious artyness of the medium. Oil paints come in lovely tubes and emerge in a sumptuous buttery flow. 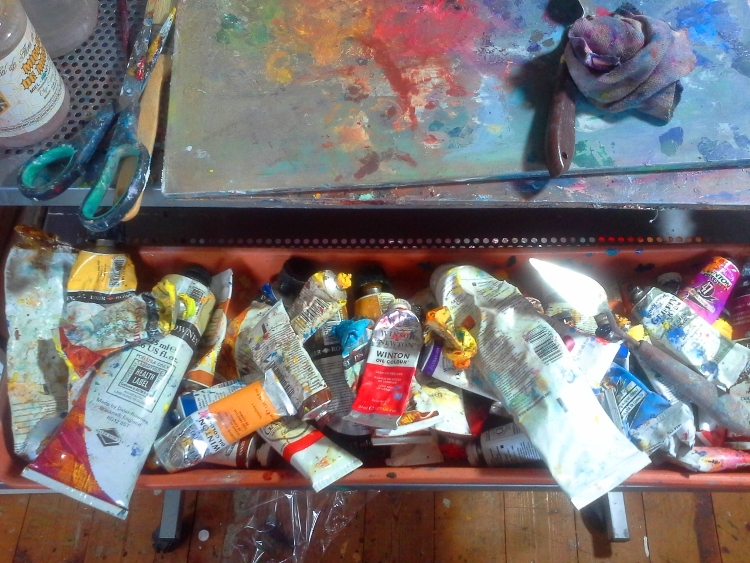 I love looking at the paint squeezed out on the palette, in proper arty order. Whites first, then yellows, greens, blues, purple, reds, orange and browns, and if you must finishing off with blacks. Many different liquids and gels can be added to oil paints to make them thick or thin, to speed up drying or extend it’s working life. I adore every colour you can buy - not that I could afford even a tenth of the available colours. There are just too many, and with such delightful names, Pacific Blue, Ultramarine, Quinacridone Magenta, Mars Violet Transparent Oxide Yellow and my favourite Rose Madder, name not colour that is. My all time favourite colour, for now, has to be Cobalt Blue. Part of the allure is the traditional special way of applying oil paint. “lean to fat” meaning start with very thin paint, often mixed with spirit, then progressively add thicker heavier layers with more oil in them. When you start with a transparent colour then add marks of opaque paint something magical happens. You can move paint around on the surface….for ages. Now isn’t that useful? You can also leave the top off your paint tubes and the won’t dry in a hurry. Another advantage told to me by Nick Tearle Fenland artist. An oil painting doesn’t need to sit behind glass , and if on a gallery wrap canvas doesn’t need framing either, so you get the art, the whole art and nothing but the art. Oil painters’ brushes are proper working tools, sturdy with names like filbert, hog, Egbert, long flat, short flat and bright. I’m a sucker for a brush catalogue and Rosemary’s Brushes is my favourite. I own over a 100 brushes, not to mention at least 10 palette knives and assorted silicone colour shapers. Oil paints lend themselves to a variety of working methods - from the “paint it all at once” alla prima style much favoured by the plein air fraternity to the more measured approach suitable for the studio where you can build up layer after layer, often letting it dry in between. An oil painting is durable, not often damaged or faded by light. If it gets dirty you can sponge it down..gently and carefully. My paintings will outlast me. My grandchildren can even hand them down to their grandchildren, if they care too. And most of all no other medium gives such a subtle, nuanced result. The finished painting is only limited by the the artist’s vision and skill, not the painting medium. These are some of the reasons I love oil paints and have made them my primary materials for working over the years. And this is where my journey has led me through lots of practice and loads of experimentation. Please look at the GALLERY on this website and enjoy. My first oil painting kit.